The day started at 7am with staff and Boy Scout and Cub Scout units along with Rainbow Girls, Veterans organizations, motorcycle and church groups placing flags at veteran’s headstones. These efforts continued until after 9:00am. 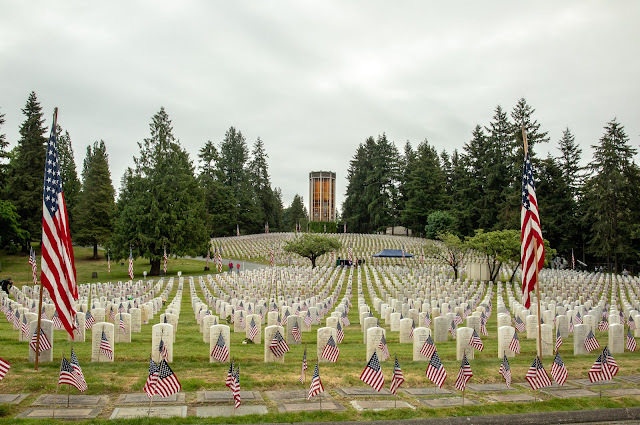 While taking photographs of volunteers placing flags I met Peter Sessum, an Army Veteran who has served or trained in eleven different countries including Afghanistan. He created “The Dogtag Chronicles” website to give a voice to veterans after hearing misconceptions about the military from classmates. 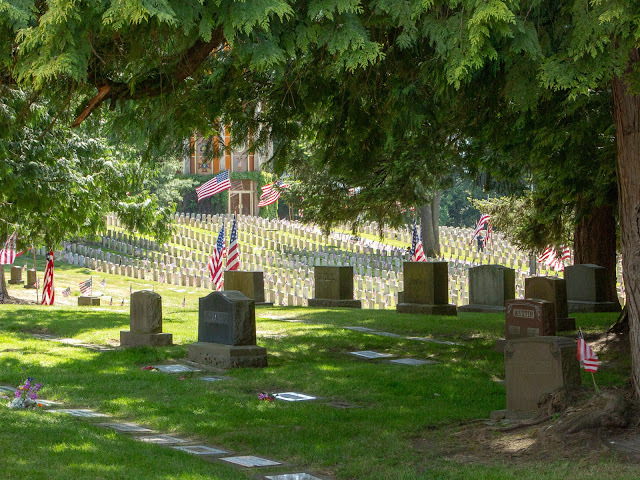 Peter had taken two days off from his work as Media Relations Specialist at FEMA to clean headstones with other veterans in preparation for Memorial Day Celebrations. 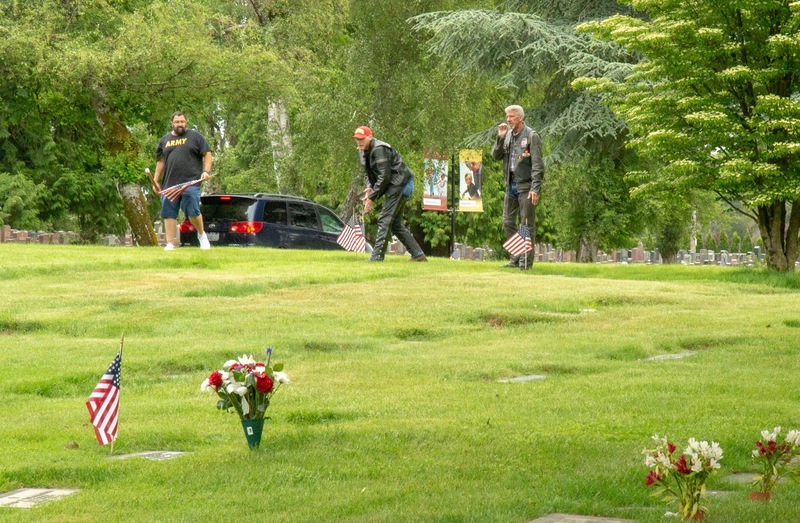 He was back on Monday morning working with volunteers to ensure every veteran’s headstone had a flag, remembering their service to our country. 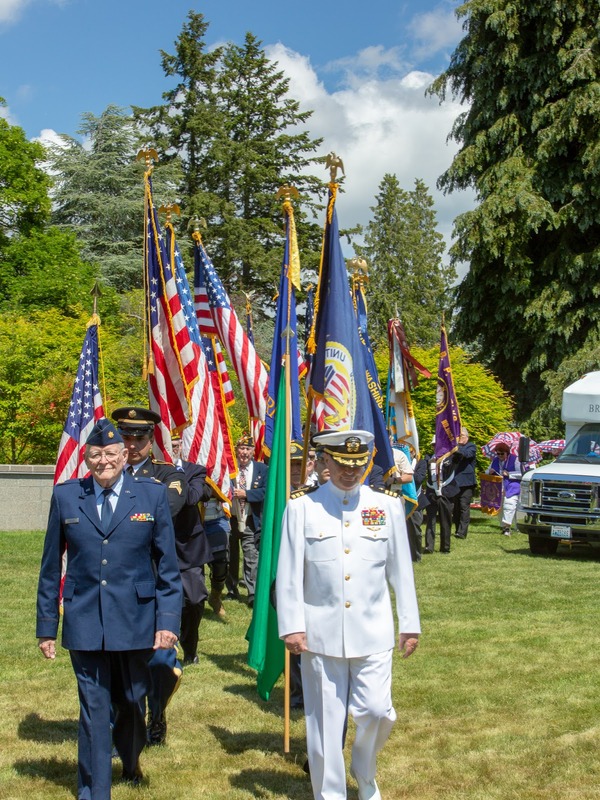 I also spoke with Shoreline Veterans, Scouts and Cub Scouts and Rainbow Girls who were moved by the experience of remembering our veterans and were impressed by the number of conflicts that were represented by the veterans interred at Evergreen-Washelli -- from the Civil War to current conflicts throughout the world. 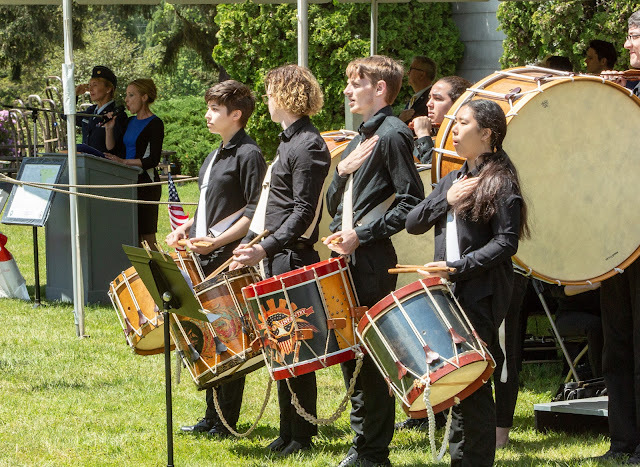 At 1:30pm Seattle Pacific University Symphonic Wind Ensemble and Drum Corps played a musical prelude. At 2:00pm the celebration began with the Parade of Colors, followed by Memorial Day addresses by Lieutenant General Gary J. Volesky, Commanding General I Corps, Joint Base Lewis-McChord and Michael Reagan from the Fallen Heroes Portrait Project. Speaking with Michael Reagan, a Marine veteran member who grew up in North Seattle and served in Viet Nam, he related how he has developed a love for those who have served and had never met in person. He has completed over 10,000 portraits most of them of veterans whom he did not know. 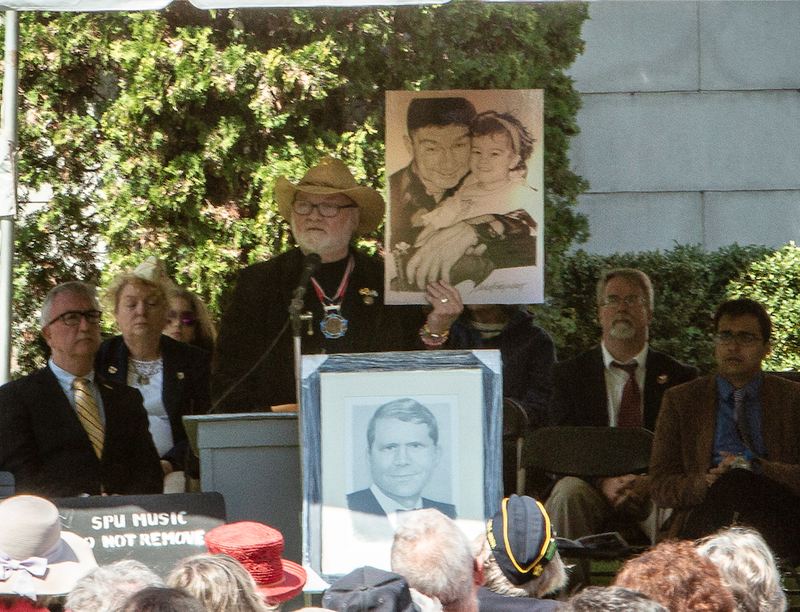 He continues to create portraits of veterans for their families to remember them. During his address he stated his belief that as we repeat the names of those who served and died they will be remembered, and he named many of those veterans. 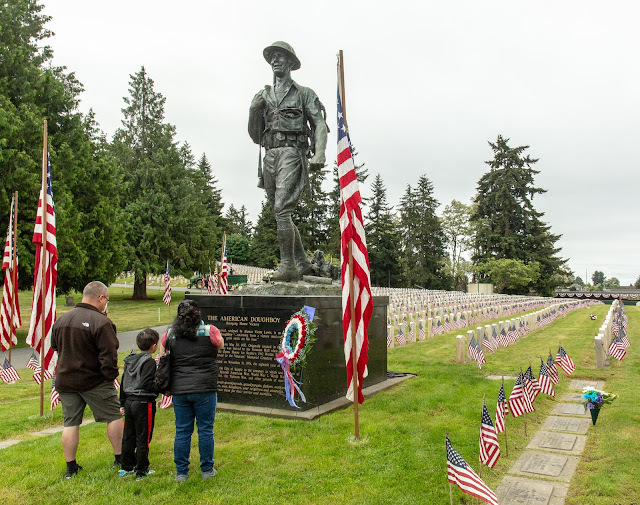 He encouraged those in attendance to spend time walking through the memorial park and reading the names of the veteran so they will be remembered, particularly on this Memorial Day.